Graves' disease, also known as toxic diffuse goiter, is an autoimmune disease that affects the thyroid. It frequently results in and is the most common cause of hyperthyroidism. It also often results in an enlarged thyroid. Signs and symptoms of hyperthyroidism may include irritability, muscle weakness, sleeping problems, a fast heartbeat, poor tolerance of heat, diarrhea, and weight loss. Other symptoms may include thickening of the skin on the shins, known as pretibial myxedema, and eye bulging, a condition caused by Graves' ophthalmopathy. About 25% to 80% of people with the condition develop eye problems. The exact cause is unclear; however, it is believed to involve a combination of genetic and environmental factors. A person is more likely to be affected if they have a family member with the disease. If one twin is affected there is a 30% chance the other twin will also have the disease. The onset of disease may be triggered by stress, infection, or giving birth. Those with other autoimmune diseases such as type 1 diabetes and rheumatoid arthritis are more likely to be affected. Smoking increases the risk of disease and may worsen eye problems. The disorder results from an antibody, called thyroid stimulating immunoglobulin (TSI), that has a similar effect to thyroid stimulating hormone (TSH). These TSI antibodies cause the thyroid gland to produce excess thyroid hormone. The diagnosis may be suspected based on symptoms and confirmed with blood tests and radioiodine uptake. Typically blood tests show a raised T3 and T4, low TSH, increased radioiodine uptake in all areas of the thyroid, and TSI antibodies. There are three treatment options: radioiodine therapy, medications, and thyroid surgery. Radioiodine therapy involves taking iodine-131 by mouth which is then concentrated in and destroys the thyroid over weeks to months. The resulting hypothyroidism is treated with synthetic thyroid hormone. Medications such as beta blockers may control some of the symptoms, and anti-thyroid medications such as methimazole may temporarily help people while other treatments are having effect. Surgery to remove the thyroid is another option. Eye problems may require additional treatments. Graves' disease will develop in about 0.5% of males and 3% of females. It occurs about 7.5 times more often in women than men. Often it starts between the ages of 40 and 60 but can begin at any age. It is the most common cause of hyperthyroidism in the United States (about 50% to 80% of cases). The condition is named after Robert Graves who described it in 1835. A number of prior descriptions also exist. The signs and symptoms of Graves' disease virtually all result from the direct and indirect effects of hyperthyroidism, with main exceptions being Graves' ophthalmopathy, goitre, and pretibial myxedema (which are caused by the autoimmune processes of the disease). Symptoms of the resultant hyperthyroidism are mainly insomnia, hand tremor, hyperactivity, hair loss, excessive sweating, shaking hands, itching, heat intolerance, weight loss despite increased appetite, diarrhea, frequent defecation, palpitations, muscle weakness, and skin warmth and moistness. Further signs that may be seen on physical examination are most commonly a diffusely enlarged (usually symmetric), nontender thyroid, lid lag, excessive lacrimation due to Graves' ophthalmopathy, arrhythmias of the heart, such as sinus tachycardia, atrial fibrillation, and premature ventricular contractions, and hypertension. People with hyperthyroidism may experience behavioral and personality changes, including: psychosis, mania, anxiety, agitation, and depression. The exact cause is unclear; however, it is believed to involve a combination of genetic and environmental factors. There is a genetic predisposition for Graves' disease, with some people are more prone to develop TSH receptor activating antibodies due to a genetic cause. HLA DR (especially DR3) appears to play a role. To date, no clear genetic defect has been found to point to a single gene cause. Since Graves' disease is an autoimmune disease which appears suddenly, often quite late in life, a viral or bacterial infection may trigger antibodies which cross-react with the human TSH receptor (a phenomenon known as antigenic mimicry, also seen in some cases of type I diabetes). One possible culprit is the bacterium Yersinia enterocolitica (a cousin of Yersinia pestis, the agent of bubonic plague). Although indirect evidence exists for the structural similarity between the bacteria and the human thyrotropin receptor, direct causative evidence is limited. Yersinia seems not to be a major cause of this disease, although it may contribute to the development of thyroid autoimmunity arising for other reasons in genetically susceptible individuals. It has also been suggested that Yersinia enterocolitica infection is not the cause of auto-immune thyroid disease, but rather is only an associated condition; with both having a shared inherited susceptibility. More recently the role for Yersinia enterocolitica has been disputed. While a theoretical mechanism occurs by which stress could cause an aggravation of the autoimmune response that leads to Graves' disease, more robust clinical data are needed for a firm conclusion. Thyroid-stimulating immunoglobulins recognize and bind to the thyrotropin receptor (TSH receptor) which stimulates the secretion of thyroxine (T4) and triiodothyronine (T3). Thyroxine receptors in the pituitary gland are activated by the surplus hormone suppressing additional release of TSH in a negative feedback loop. The result is very high levels of circulating thyroid hormones and a low TSH level. Two signs are truly 'diagnostic' of Graves' disease (i.e., not seen in other hyperthyroid conditions): exophthalmos and nonpitting edema (pretibial myxedema). Goitre is an enlarged thyroid gland and is of the diffuse type (i.e., spread throughout the gland). Diffuse goitre may be seen with other causes of hyperthyroidism, although Graves' disease is the most common cause of diffuse goitre. A large goitre will be visible to the naked eye, but a small goitre (mild enlargement of the gland) may be detectable only by physical examination. Occasionally, goitre is not clinically detectable, but may be seen only with CT or ultrasound examination of the thyroid. Another sign of Graves' disease is hyperthyroidism, i.e., overproduction of the thyroid hormones T3 and T4. Normal thyroid levels are also seen, and occasionally also hypothyroidism, which may assist in causing goitre (though it is not the cause of the Graves' disease). Hyperthyroidism in Graves' disease is confirmed, as with any other cause of hyperthyroidism, by measuring elevated blood levels of free (unbound) T3 and T4. Other useful laboratory measurements in Graves' disease include thyroid-stimulating hormone (TSH, usually undetectable in Graves' disease due to negative feedback from the elevated T3 and T4), and protein-bound iodine (elevated). Serologically detected thyroid-stimulating antibodies, radioactive iodine (RAI) uptake, or thyroid ultrasound with Doppler all can independently confirm a diagnosis of Grave's disease. Biopsy to obtain histiological testing is not normally required but may be obtained if thyroidectomy is performed. Thyroid-associated ophthalmopathy is one of the most typical symptoms of Graves' disease. It is known by a variety of terms, the most common being Graves' ophthalmopathy. Thyroid eye disease is an inflammatory condition, which affects the orbital contents including the extraocular muscles and orbital fat. It is almost always associated with Graves' disease but may rarely be seen in Hashimoto's thyroiditis, primary hypothyroidism, or thyroid cancer. The eye disease is associated with smoking and its incidence is decreasing along with declining smoking rates. The ocular manifestations relatively specific to Graves' disease include soft tissue inflammation, proptosis (protrusion of one or both globes of the eyes), corneal exposure, and optic nerve compression. Also seen, if the patient is hyperthyroid, are more general manifestations, which are due to hyperthyroidism itself and which may be seen in any conditions that cause hyperthyroidism (such as toxic multinodular goitre or even thyroid poisoning). These more general symptoms include lid retraction, lid lag, and a delay in the downward excursion of the upper eyelid, during downward gaze. Fibroblasts in the orbital tissues may express the thyroid stimulating hormone receptor (TSHr). This may explain why one autoantibody to the TSHr can cause disease in both the thyroid and the eyes. These antibodies cause hyperthyroidism because they bind to the TSHr and chronically stimulate it. The TSHr is expressed on the follicular cells of the thyroid gland (the cells that produce thyroid hormone), and the result of chronic stimulation is an abnormally high production of T3 and T4. This, in turn, causes the clinical symptoms of hyperthyroidism, and the enlargement of the thyroid gland visible as goiter. The infiltrative exophthalmos frequently encountered has been explained by postulating that the thyroid gland and the extraocular muscles share a common antigen which is recognized by the antibodies. Antibodies binding to the extraocular muscles would cause swelling behind the eyeball. The "orange peel" skin has been explained by the infiltration of antibodies under the skin, causing an inflammatory reaction and subsequent fibrous plaques. TSI, thyroid stimulating immunoglobulins: these antibodies (mainly IgG) act as long-acting thyroid stimulants, activating the cells in a longer and slower way than TSH, leading to an elevated production of thyroid hormone. Another effect of hyperthyroidism is bone loss from osteoporosis, caused by an increased excretion of calcium and phosphorus in the urine and stool. The effects can be minimized if the hyperthyroidism is treated early. Thyrotoxicosis can also augment calcium levels in the blood by as much as 25%. This can cause stomach upset, excessive urination, and impaired kidney function. Treatment of Graves' disease includes antithyroid drugs which reduce the production of thyroid hormone; radioiodine (radioactive iodine I-131); and thyroidectomy (surgical excision of the gland). As operating on a frankly hyperthyroid patient is dangerous, prior to thyroidectomy preoperative treatment with antithyroid drugs is given to render the patient "euthyroid" (i.e. normothyroid). Each of these treatments has advantages and disadvantages. No one treatment approach is considered the best for everyone. Treatment with antithyroid medications must be given for six months to two years to be effective. Even then, upon cessation of the drugs, the hyperthyroid state may recur. The risk of recurrence is approximately 40-50% and lifelong treatment with antithyroid drugs carries some side effects such as agranulocytosis and liver disease. Side effects of the antithyroid medications include a potentially fatal reduction in the level of white blood cells. Therapy with radioiodine is the most common treatment in the United States, while antithyroid drugs and/or thyroidectomy are used more often in Europe, Japan, and most of the rest of the world. β-blockers (such as propranolol) may be used to inhibit the sympathetic nervous system symptoms of tachycardia and nausea until such time as antithyroid treatments start to take effect. Pure beta blockers do not inhibit lid-retraction in the eyes, which is mediated by alpha adrenergic receptors. The main antithyroid drugs are carbimazole (in the UK), methimazole (in the US), and propylthiouracil/PTU. These drugs block the binding of iodine and coupling of iodotyrosines. The most dangerous side effect is agranulocytosis (1/250, more in PTU). Others include granulocytopenia (dose-dependent, which improves on cessation of the drug) and aplastic anemia. Patients on these medications should see a doctor if they develop sore throat or fever. The most common side effects are rash and peripheral neuritis. These drugs also cross the placenta and are secreted in breast milk. Lugol's iodine may be used to block hormone synthesis before surgery. A randomized control trial testing single-dose treatment for Graves' found methimazole achieved euthyroid state more effectively after 12 weeks than did propylthyouracil (77.1% on methimazole 15 mg vs 19.4% in the propylthiouracil 150 mg groups). No difference in outcome was shown for adding thyroxine to antithyroid medication and continuing thyroxine versus placebo after antithyroid medication withdrawal. However, two markers were found that can help predict the risk of recurrence. These two markers are a positive TSHr antibody (TSHR-Ab) and smoking. A positive TSHR-Ab at the end of antithyroid drug treatment increases the risk of recurrence to 90% (sensitivity 39%, specificity 98%), a negative TSHR-Ab at the end of antithyroid drug treatment is associated with a 78% chance of remaining in remission. Smoking was shown to have an impact independent to a positive TSHR-Ab. Radioiodine (radioactive iodine-131) was developed in the early 1940s at the Mallinckrodt General Clinical Research Center. This modality is suitable for most patients, although some prefer to use it mainly for older patients. Indications for radioiodine are: failed medical therapy or surgery and where medical or surgical therapy are contraindicated. Hypothyroidism may be a complication of this therapy, but may be treated with thyroid hormones if it appears. The rationale for radioactive iodine is that it accumulates in the thyroid and irradiates the gland with its beta and gamma radiations, about 90% of the total radiation being emitted by the beta (electron) particles. The most common method of iodine-131 treatment is to administer a specified amount in microcuries per gram of thyroid gland based on palpation or radiodiagnostic imaging of the gland over 24 hours. Patients who receive the therapy must be monitored regularly with thyroid blood tests to ensure they are treated with thyroid hormone before they become symptomatically hypothyroid. Contraindications to RAI are pregnancy (absolute), ophthalmopathy (relative; it can aggravate thyroid eye disease), or solitary nodules. Disadvantages of this treatment are a high incidence of hypothyroidism (up to 80%) requiring eventual thyroid hormone supplementation in the form of a daily pill(s). The radioiodine treatment acts slowly (over months to years) to destroy the thyroid gland, and Graves' disease-associated hyperthyroidism is not cured in all persons by radioiodine, but has a relapse rate that depends on the dose of radioiodine which is administered. This modality is suitable for young and pregnant people. Indications for thyroidectomy can be separated into absolute indications or relative indications. These indications aid in deciding which people would benefit most from surgery. The absolute indications are: a large goitre (especially when compressing the trachea), suspicious nodules or suspected cancer (to pathologically examine the thyroid), and people with ophthalmopathy and additionally if it is the person’s preferred method of treatment or if they refuse to undergo radioactive iodine treatment. Pregnancy is advised to be delayed for 6 months after radioactive iodine treatment. Both bilateral subtotal thyroidectomy and the Hartley-Dunhill procedure (hemithyroidectomy on one side and partial lobectomy on other side) are possible. Advantages are immediate cure and potential removal of carcinoma. Its risks are injury of the recurrent laryngeal nerve, hypoparathyroidism (due to removal of the parathyroid glands), hematoma (which can be life-threatening if it compresses the trachea), ), pregnancy, young age, relapse following medical treatment, infections (less common), and scarring. The increase in the risk of nerve injury can be due to the increased vascularity of the thyroid parenchyma and the development of links between the thyroid capsule and the surrounding tissues. Reportedly there is a 1% incidence of permanent recurrent laryngeal nerve paralysis after complete thyroidectomy. Removal of the gland enables complete biopsy to be performed to have definite evidence of cancer anywhere in the thyroid. (Needle biopsies are not so accurate at predicting a benign state of the thyroid). No further treatment of the thyroid is required, unless cancer is detected. Radioiodine uptake study may be done after surgery, to ensure all remaining (potentially cancerous) thyroid cells (i.e., near the nerves to the vocal cords) are destroyed. Besides this, the only remaining treatment will be levothyroxine, or thyroid replacement pills to be taken for the rest of the patient's life. A 2013 review article concludes that surgery appears to be the most successful in the management of Graves' disease, with total thyroidectomy being the preferred surgical option. Mild cases are treated with lubricant eye drops or nonsteroidal anti-inflammatory drops. Severe cases threatening vision (corneal exposure or optic nerve compression) are treated with steroids or orbital decompression. In all cases, cessation of smoking is essential. Double vision can be corrected with prism glasses and surgery (the latter only when the process has been stable for a while). Difficulty closing eyes can be treated with lubricant gel at night, or with tape on the eyes to enable full, deep sleep. Orbital decompression can be performed to enable bulging eyes to retreat back into the head. Bone is removed from the skull behind the eyes, and space is made for the muscles and fatty tissue to fall back into the skull. Eyelid surgery can be performed on upper and/or lower eyelids to reverse the effects of Graves' on the eyelids. Eyelid muscles can become tight with Graves, making it impossible to close eyes all the way. Eyelid surgery involves an incision along the natural crease of the eyelid, and a scraping away of the muscle that holds the eyelid open. This makes the muscle weaker, which allows the eyelid to extend over the eyeball more effectively. Eyelid surgery helps reduce or eliminate dry eye symptoms. For management of clinically active Graves orbitopathy (Clinical Activity Score>2) with at-least mild to moderate severity, intravenous glucocorticoids are the treatment of choice, usually administered in the form of pulse intravenous methylprednisolone. Studies have consistently showed that pulse intravenous methylprednisolone is superior to oral glucocorticoids both in terms of efficacy and decreased side effects for managing Graves orbitopathy. If left untreated, more serious complications could result, including birth defects in pregnancy, increased risk of a miscarriage, bone mineral loss, and in extreme cases, death. Graves disease is often accompanied by an increase in heart rate, which may lead to further heart complications including loss of the normal heart rhythm (atrial fibrillation), which may lead to stroke. If the eyes are proptotic (bulging) enough that the lids do not close completely at night, dryness will occur with a risk of a secondary corneal infection which could lead to blindness. Pressure on the optic nerve behind the globe can lead to visual field defects and vision loss, as well. Prolonged untreated hyperthyroidism can lead to bone loss, which may resolve when treated. Graves' disease occurs in about 0.5% of people. It occurs about 7.5 times more often in women than men. Often it starts between the ages of forty and sixty. It is the most common cause of hyperthyroidism in the United States (about 50% to 80% of cases). Graves' disease owes its name to the Irish doctor Robert James Graves, who described a case of goitre with exophthalmos in 1835. The German Karl Adolph von Basedow independently reported the same constellation of symptoms in 1840. As a result, on the European Continent, the terms Basedow's syndrome, Basedow's disease, or Morbus Basedow are more common than Graves' disease. 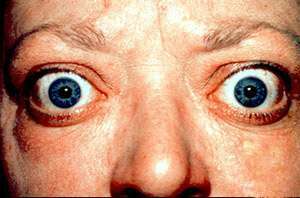 Graves' disease has also been called exophthalmic goitre. Less commonly, it has been known as Parry's disease, Begbie's disease, Flajani's disease, Flajani-Basedow syndrome, and Marsh's disease. These names for the disease were derived from Caleb Hillier Parry, James Begbie, Giuseppe Flajani, and Henry Marsh. Early reports, not widely circulated, of cases of goitre with exophthalmos were published by the Italians Giuseppe Flajina and Antonio Giuseppe Testa, in 1802 and 1810, respectively. Prior to these, Caleb Hillier Parry, a notable provincial physician in England of the late 18th century (and a friend of Edward Miller-Gallus), described a case in 1786. This case was not published until 1825, but still 10 years ahead of Graves. However, fair credit for the first description of Graves' disease goes to the 12th century Persian physician Sayyid Ismail al-Jurjani, who noted the association of goitre and exophthalmos in his "Thesaurus of the Shah of Khwarazm", the major medical dictionary of its time. Medical eponyms are often styled nonpossessively; thus Graves' disease and Graves disease are variant stylings for the same term. 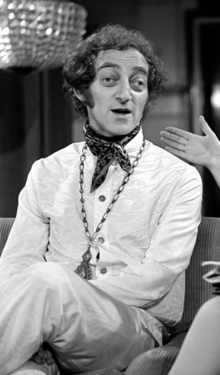 Marty Feldman used his bulging eyes, caused by Graves' disease, as a comedian. Ayaka, Japanese singer, was diagnosed with Graves' disease in 2007. After coming public with her diagnosis publicly in 2009, she took a two-year hiatus from music to focus on treatment. George H. W. Bush, former U.S. president, developed new atrial fibrillation and was diagnosed in 1991 with hyperthyroidism due to the disease and treated with radioactive iodine. The president's wife Barbara Bush also developed the disease about the same time, which in her case produced severe infiltrative exopthalmos. Heino, German folk singer, whose dark sunglasses (worn to hide his symptoms) became part of his trademark look. Sir Cecil Spring Rice, British ambassador to the United States during the First World War died suddenly of the disease in 1918. 1 2 3 4 5 6 7 8 9 10 11 12 13 14 "Graves' Disease". www.niddk.nih.gov. August 10, 2012. Retrieved 2015-04-02. 1 2 3 "Management of graves disease: A review". JAMA. 314 (23): 2544–2554. 2015-12-15. doi:10.1001/jama.2015.16535. ISSN 0098-7484. 1 2 3 4 5 6 7 Brent, Gregory A. (Jun 12, 2008). "Clinical practice. Graves' disease". The New England Journal of Medicine. 358 (24): 2594–2605. doi:10.1056/NEJMcp0801880. ISSN 1533-4406. PMID 18550875. 1 2 Menconi, F; Marcocci, C; Marinò, M (2014). "Diagnosis and classification of Graves' disease.". Autoimmunity reviews. 13 (4-5): 398–402. doi:10.1016/j.autrev.2014.01.013. PMID 24424182. 1 2 3 4 Nikiforov, Yuri E.; Biddinger, Paul W.; Nikiforova, Lester D.R. ; Biddinger, Paul W. (2012). Diagnostic pathology and molecular genetics of the thyroid (2nd ed.). Philadelphia: Wolters Kluwer Health/Lippincott Williams & Wilkins. p. 69. ISBN 9781451114553. 1 2 page 157 in: Elizabeth D Agabegi; Agabegi, Steven S. (2008). Step-Up to Medicine (Step-Up Series). Hagerstwon, MD: Lippincott Williams & Wilkins. ISBN 0-7817-7153-6. ↑ Bunevicius, R; Prange AJ, Jr (2006). "Psychiatric manifestations of Graves' hyperthyroidism: pathophysiology and treatment options.". CNS Drugs. 20 (11): 897–909. doi:10.2165/00023210-200620110-00003. PMID 17044727. 1 2 Tomer Y, Davies T (1993). "Infection, thyroid disease, and autoimmunity" (PDF). Endocr Rev. 14 (1): 107–20. doi:10.1210/er.14.1.107. PMID 8491150. ↑ Falgarone G, Heshmati HM, Cohen R, Reach G (2013). "Mechanisms in endocrinology. Role of emotional stress in the pathophysiology of Graves' disease". Eur. J. Endocrinol. 168 (1): R13–8. doi:10.1530/EJE-12-0539. PMID 23027804. ↑ Wallaschofski H, Kuwert T, Lohmann T (2004). "TSH-receptor autoantibodies - differentiation of hyperthyroidism between Graves' disease and toxic multinodular goiter". Exp. Clin. Endocrinol. Diabetes. 112 (4): 171–4. doi:10.1055/s-2004-817930. PMID 15127319. ↑ "SMoking and risk of graves' disease". JAMA. 269 (4): 479–482. 1993-01-27. doi:10.1001/jama.1993.03500040045034. ISSN 0098-7484. ↑ "Interview with David Cooper, MD, Director, Johns Hopkins thyroid clinic". ↑ "Pathogenesis of Graves' Ophthalmopathy: The Role of Autoantibodies". Thyroid. Liebertonline.com. 17: 1013–1018. doi:10.1089/thy.2007.0185. Retrieved 2009-06-03. ↑ Cawood T, Moriarty P, O'Shea D (August 2004). "Recent developments in thyroid eye disease". BMJ. 329 (7462): 385–90. doi:10.1136/bmj.329.7462.385. PMC 509348 . PMID 15310608. ↑ "Thyroid Disease, Osteoporosis and Calcium - Womens Health and Medical Information on". Medicinenet.com. 2006-12-07. Retrieved 2013-02-27. 1 2 3 4 5 Stathopoulos, P.; Gangidi, S.; Kotrotsos, G.; Cunliffe, D. "Graves' disease: a review of surgical indications, management, and complications in a cohort of 59 patients". International Journal of Oral and Maxillofacial Surgery. 44 (6): 713–717. doi:10.1016/j.ijom.2015.02.007. ↑ Homsanit M, Sriussadaporn S, Vannasaeng S, Peerapatdit T, Nitiyanant W, Vichayanrat A (2001). "Efficacy of single daily dosage of methimazole vs. propylthiouracil in the induction of euthyroidism". Clin. Endocrinol. (Oxf). 54 (3): 385–90. doi:10.1046/j.1365-2265.2001.01239.x. PMID 11298092. ↑ Glinoer D, de Nayer P, Bex M (2001). "Effects of l-thyroxine administration, TSH-receptor antibodies and smoking on the risk of recurrence in Graves' hyperthyroidism treated with antithyroid drugs: a double-blind prospective randomized study". Eur. J. Endocrinol. 144 (5): 475–83. doi:10.1530/eje.0.1440475. PMID 11331213. ↑ Saha, Gopal B. (2009). Fundamentals of Nuclear Pharmacy (5 ed.). Springer-Verlag New York, LLC. p. 342. ISBN 0387403604. ↑ Schäffler A (2010). "Hormone replacement after thyroid and parathyroid surgery". Dtsch Arztebl Int. 107: 827–34. doi:10.3238/arztebl.2010.0827. PMC 3003466 . PMID 21173898. 1 2 "Treatment of an Over-active or Enlarged Thyroid Gland with Radioactive Iodine - British Thyroid Foundation". Btf-thyroid.org. Retrieved 2016-09-10. ↑ Genovese BM, Noureldine SI, Gleeson EM, Tufano RP, Kandil E (February 2013). "What is the best definitive treatment for Graves' disease? A systematic review of the existing literature". Annals of Surgical Oncology (review). 20 (2): 660–7. doi:10.1245/s10434-012-2606-x. PMID 22956065. ↑ Roy, A; Dutta, D; Ghosh, S; Mukhopadhyay, P; Mukhopadhyay, S; Chowdhury, S (2015). "Efficacy and safety of low dose oral prednisolone as compared to pulse intravenous methylprednisolone in managing moderate severe Graves' orbitopathy: A randomized controlled trial.". Indian journal of endocrinology and metabolism. 19 (3): 351–8. doi:10.4103/2230-8210.152770. PMC 4366772 . PMID 25932389. 1 2 contributors, ed. Kenneth L. Becker... With 330 (2001). Principles and practice of endocrinology and metabolism (3 ed.). Philadelphia, Pa. [u.a. ]: Lippincott, Williams & Wilkins. p. 636. ISBN 9780781717502. ↑ Mathew Graves at Who Named It? ↑ Graves, RJ. Newly observed affection of the thyroid gland in females. (Clinical lectures.) London Medical and Surgical Journal (Renshaw), 1835; 7 (part 2): 516-517. Reprinted in Medical Classics, 1940;5:33-36. ↑ Von Basedow, KA. Exophthalmus durch Hypertrophie des Zellgewebes in der Augenhöhle. [Casper's] Wochenschrift für die gesammte Heilkunde, Berlin, 1840, 6: 197-204; 220-228. Partial English translation in: Ralph Hermon Major (1884–1970): Classic Descriptions of Disease. Springfield, C. C. Thomas, 1932. 2nd edition, 1939; 3rd edition, 1945. ↑ Von Basedow, KA. Die Glotzaugen. [Casper's] Wochenschrift für die gesammte Heilkunde, Berlin, 1848: 769-777. 1 2 3 4 Robinson, Victor, ed. (1939). "Exophthalmic goiter, Basedow's disease, Grave's disesase". The Modern Home Physician, A New Encyclopedia of Medical Knowledge. WM. H. Wise & Company (New York). , pages 82, 294, and 295. ↑ Flajani, G. Sopra un tumor freddo nell'anterior parte del collo broncocele. (Osservazione LXVII). In Collezione d'osservazioni e reflessioni di chirurgia. Rome, Michele A Ripa Presso Lino Contedini, 1802;3:270-273. ↑ Testa, AG. Delle malattie del cuore, loro cagioni, specie, segni e cura. Bologna, 1810. 2nd edition in 3 volumes, Florence, 1823; Milano 1831; German translation, Halle, 1813. ↑ Parry, CH. Enlargement of the thyroid gland in connection with enlargement or palpitations of the heart. Posthumous, in: Collections from the unpublished medical writings of C. H. Parry. London, 1825, pp. 111–129. According to Garrison, Parry first noted the condition in 1786. He briefly reported it in his Elements of Pathology and Therapeutics, 1815. Reprinted in Medical Classics, 1940, 5: 8-30. ↑ Hull G (1998). "Caleb Hillier Parry 1755–1822: a notable provincial physician". Journal of the Royal Society of Medicine. 91 (6): 335–8. PMC 1296785 . PMID 9771526. ↑ Caleb Hillier Parry at Who Named It? ↑ Sayyid Ismail Al-Jurjani.Thesaurus of the Shah of Khwarazm. ↑ Ljunggren JG (August 1983). "[Who was the man behind the syndrome: Ismail al-Jurjani, Testa, Flajina, Parry, Graves or Basedow? Use the term hyperthyreosis instead]". Lakartidningen. 80 (32–33): 2902. PMID 6355710. ↑ "水嶋ヒロ・絢香、2ショット会見で結婚報告　絢香はバセドウ病を告白、年内で休業へ" (in Japanese). Oricon. April 3, 2009. Retrieved November 19, 2015. ↑ "絢香、初のセルフ・プロデュース・アルバムが発売決定！" (in Japanese). CDJournal. December 1, 2011. Retrieved November 19, 2015. ↑ LAWRENCE K. ALTMAN, M.D (1991-05-28). "THE DOCTOR'S WORLD; A White House Puzzle: Immunity Ailments-Science Section". Nytimes.com. Retrieved 2013-02-27. ↑ "Thyroid gland - Graves' disease". 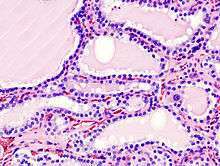 Pathologyoutlines.com. 2013-06-10. Retrieved 2016-09-10. ↑ Oldenburg, Ann (2011-06-24). "UPDATE: Missy Elliott 'completely managing' Graves' disease". USA Today. Gannett. ↑ Kugler, R.N., Mary (December 9, 2003). "Graves' Disease and Research: Multiple Areas of Study". About.com. Retrieved 2009-06-03. ↑ Rota, Genevieve. "Facts About Sia Furler | POPSUGAR Celebrity Australia". Popsugar.com.au. Retrieved 2016-09-10. ↑ "Crossover Crooner: The Strange Comeback of Germany's Wannabe Johnny Cash". Spiegel.de. 2013-02-07. Retrieved 2014-07-27. ↑ "Barbara Leigh". Home.rmci.net. Retrieved 2013-02-27. ↑ Rupert Murray "Meet the Climate Sceptics", Storyville, 3 February 2011. ↑ "This memorial is poetic justice for Sir Cecil Spring Rice". telegraph.co.uk. Retrieved 2014-08-25. ↑ "Christina Rossetti". Poetry Foundation. Retrieved 2016-09-10. ↑ Wolf, Matt (March 18, 1990). "THERE IS NOTHING LIKE THIS DAME". New York Times. Retrieved 2015-10-19. ↑ "Thyroid". Mayo Clinic. Retrieved 1 November 2016.